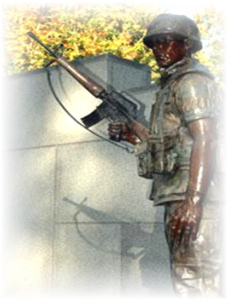 The sculpture for the memorial is designed by Nationally Recognized Artist Abbe' Godwin to honor all those who served alongside the Marine as Fleet Marine Force Corpsmen. It is intended to be a place of honor and reflection, a place of recognition of the duties performed and the bonds forged in conflict. Abbe' Godwin of Colfax, North Carolina, designed the state memorial in Raleigh, which was funded completely with privately raised funds. "After the Firefight" is dedicated to the men and women of the state who served in the nation's longest and most controversial overseas war. 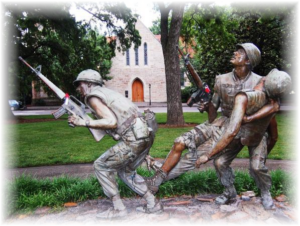 Godwin's sculpture depicts two men carrying a wounded comrade to a nearby medevac landing zone. 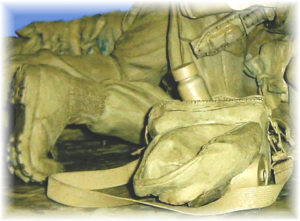 The clothing and equipment of the soldiers on this detailed, heroic statue were sculpted from artifacts loaned to the artist by Vietnam veterans. A Peacekeeper stands guard at the Beirut Memorial sculpted by the hands of Abbe' Godwin. On the left hand is a wedding ring. In the right hand an M-16 rifle. The eyes keep watch - a look of determination frozen on the bronze face. He is 6 feet tall and stands over the names of the fallen listed on the Beirut Memorial wall. 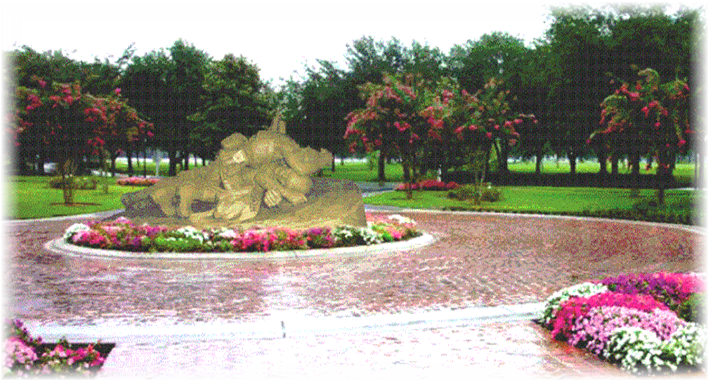 To those who visit the site off Lejeune Boulevard, the statue is known as "The Peacekeeper." To Abbe' Godwin, the artist who created it, the figure will always be "The Guardian of Freedom." 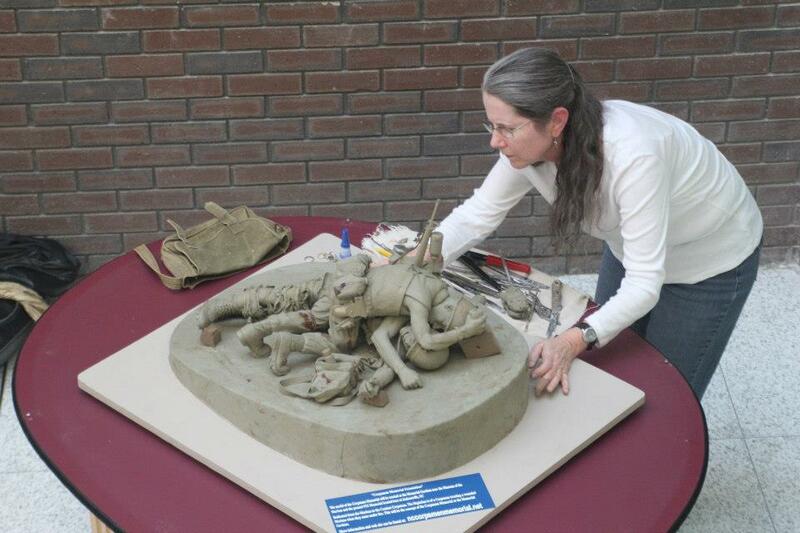 The incredible lifelike detail that Abbe' Godwin captures in her bronze sculptures, and in the authenticity of the emotion she evokes in the scenes portrayed in her work made the choice easy in selecting the artist to design The North Carolina Corpsmen Memorial. The photo above of the maquette which stands only 14 inches tall demonstrates the extreme attention to detail in all of Abbe' Godwin's work. 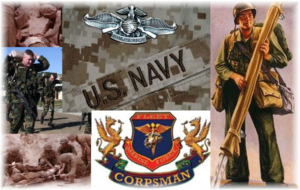 The U.S. Navy Corpsmen's relationship with the Fleet Marine Forces goes back more than 110 years... since the first corpsmen landed with the Marine Expeditionary Unit at Guantanamo, Cuba. The Jacksonville area is home of one of the two commands that trained corpsmen for duty with the Marines since 1950, "A memorial is long overdue." John Crazy Bear initiated the idea to create the memorial. "You will find Navy corpsmen anywhere there are Marines, wherever they fight, wherever they live; they have been and today still are in the field with our Marines side by side," Crazy Bear stated... "Such a memorial would be a place of honor for all to visit." From the beginning, the development team has chosen to make every effort to capture the reality of the unique, and intense bond of brotherhood that binds those who served as Navy Corpsmen and those who served as Marines in the field of conflict. The statues will be lifesize, ultra realistic, and circled by a brick walkway paved with bricks cast with the names of Corpsmen who gave their lives to serve the Marines. From every angle of the Memorial those who visit it will be reminded of the Marines who gave their lives in defense of the values of this nation. The Hospital Corp rating is 119 years old since it was established by Congress and President McKinley on June 17, 1898. 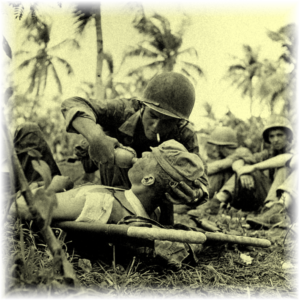 Serving with the Marine Corps, about 2,018 corpsmen have been killed in Action. 1,170 in World War II, 109 in Korea, 639 in the Vietnam War, 15 in the Marine Barracks in Beirut and as of June 17, 2010, over 55 in Iraq/Afghanistan. This Memorial will be built. We have an obligation of honor. The path has been paved. We should not let anything stand in the way of honoring them. They didn't let anything keep them from serving... Not even when it meant giving up their most precious asset, their lives. Can we count on you to do your part to help make sure this place of remembrance is built? Updates on the progress of the memorial, and other articles related to the memorial and those who served as FMF Corpsmen will be posted in our newsletter on this website.